Setting up my /P station for CQWW this weekend I made some movies to give you an impression of what setting up that station entails. This one shows you how I set up my hexbeam. It is up on the mast (around 12m/40ft high) in 20 minutes. As planned I went out this weekend to try and catch some new band DXCC - so not necessarily atno although I would have enjoyed that bonus. My focus was on the low bands this time. I did take my hexbeam just in case there were new ones for me to catch on any of the higher bands. In retrospect it was not really worth the effort though. I logged one new DXCC on 20m and three on 15m. I learned I was too late as I could have worked more new ones on 15m but soon after I started (around 15h UTC) the band started to fade. Apart from the hexbeam I took my recently constructed vertical that acts as end fed half wave on 40m and as a quarter wave on 80m with elevated radials. It turned out the end fed was resonant in part of the 160m band as well. I brought my tuner so I was able to use the whole band with that antenna. The low bands were noisy. The geomagnetic storm I experienced last Wednesday had settled a bit but it was still noisy. Another thing is that with a contest as big as CQWW the rather narrow bands are one big splatter party. This is especially true on 40m. After spending time on 15m and 20m, logging only a handful of contacts, I turned to 40m around 15:30 UTC. There was not a lot to chase there, so I went down to 160m. It was early for that band but it was easy as I did not have to change anything when switching between 40m and 160m. For 80m I had to change the antenna setup slightly so it took some time to switch to and from that band. Using my laptop with HRD Logbook I was able to monitor the cluster and see where I could find new ones. HRD shows you whether a DXCC that is spotted is already in your log for that band. Based on that information I switched between the bands. Unfortunately my laptop battery died at some point. I did bring an external battery but forgot the cable. I then relied on just listening around and on the cluster app on my phone. The downside is that I just cannot remember what DXCC I worked on what band. Moving around across the bands I logged 69 contacts in 12 hours. Not particularly impressive during a contest (I suspect some stations managed more contacts in that period). However they contribute 44 new band DXCC to my collection. My 40m antenna was working as I expected. It is not a miracle antenna but I could work what I could copy. This included PY, a new one and the ODX on this band this weekend. I logged him when I had taken down the hexbeam and just wanted to check the low bands for the last time before taking down the vertical. I was happy with that catch. There is however a lot I cannot hear that others apparently can hear - judging from QSOs where I can only copy one side. This vertical end fed is clearly not a match for a beam. Conditions weren't particularly good and QRM was incredible, so I only logged 4 new DXCC on this band. I had hoped to log more new ones to move towards my 5th 100+ DXCC. I was counting on skip to the Caribbean but I only worked 8P. My 80m antenna was better than I expected. 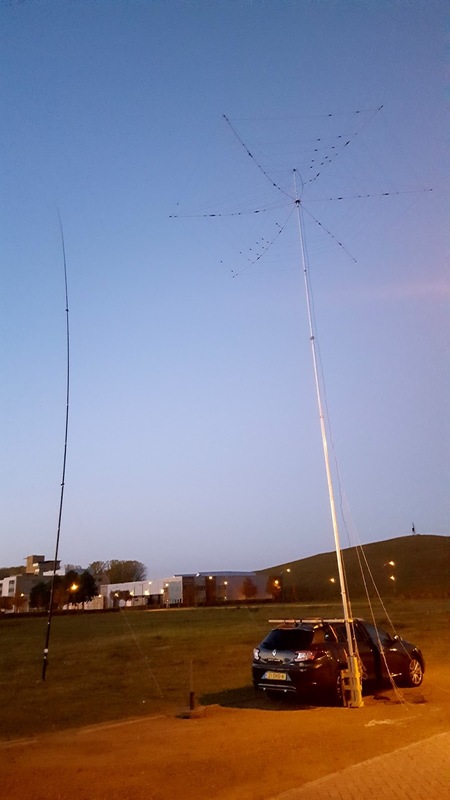 The quarter wave relies on the ground system to work and with only 4 rather short elevated radials I was not expecting a lot. But again I could work almost everything I could hear. ODX this weekend was A6 at more than 5000km and I logged 12 new DXCC on this band. Note that I don't use this band at home and I had only logged 37 DXCC before (mainly on one evening and night in the snow when I joined the PACC for the first time). On 160m I had only worked one station so far since I got my full license - some nearby german super contest station on CW on a shortened 40m wire antenna. This of course meant that almost all stations I heard were new DXCC on that band. The antenna was resonant but very short for this band (20m). I could work more than I expected but could not work everything I could hear. I noticed some stations had difficulty copying me while I could copy them without a problem. So there is still a lot to improve for this band. Starting with only 1 DXCC this was of course the best scoring band. I added a whopping 28 new DXCC here. ODX on this band was a respectable 2900km into 5B4. Conditions on HF have been better than they are the last few months. I find this a good reason to spend more time on the lower bands. Another good reason is that I completed my 100 DXCC on the fourth band just last week or so. It was on 17m. I am not counting on reaching that number on 12m any time soon - as I have failed to use that band when conditions were more favourable. So the next candidates are 40m and 80m. I could also go for 30m of course but phone remains my favourite mode. With the limited space I have at home I will need to go out /P to work new DXCC on those bands. At home I use a shortened end fed wire for 40m (just 12m long) and that will not really bring me any further than I have reached so far. 80m is even more challenging. I have not worked out an effective solution for that band yet. The other obstacle is that the areas I need to work are generally workable late at night or very early in the morning. Using phone at these hours in a room that is not sound proof will get me into trouble with the rest of the family. All of this made me decide to focus on the low bands during CQWW this month. 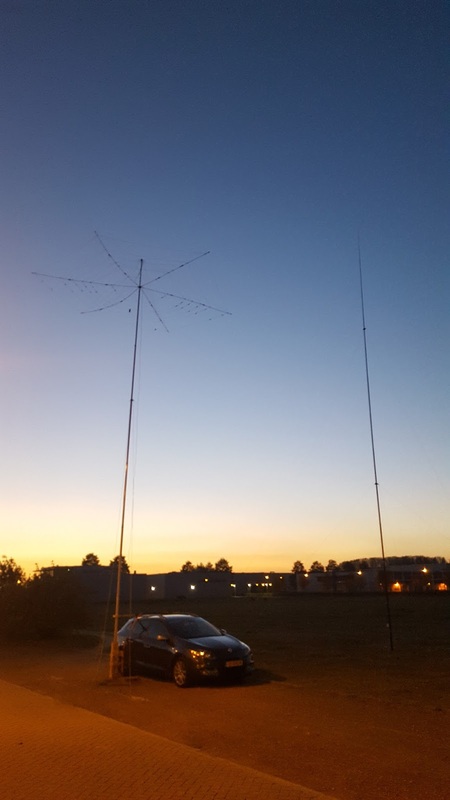 A couple of times before I have used this contest to hunt DX by reserving a considerable (to my standards) amount of time during the contest weekend going out /P with the best antennas I have. 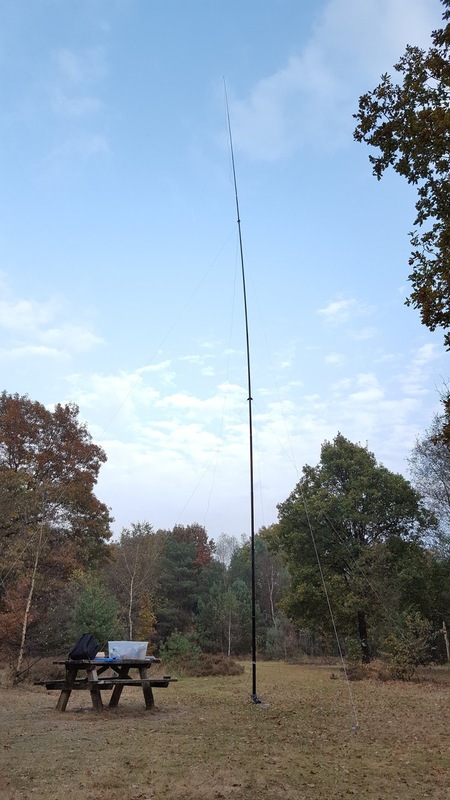 In the past I have used a 4 element mono band yagi for 10m that created an unforgettable experience where I just worked atno's like there was no tomorrow and I have used my hexbeam with success as well. On the low bands I used inverted V dipoles before. They work, and have provided me with new band DXCC but they have a (mainly) high angle radiation pattern. It would be nice to try something with a better DX profile. So that is why I went out today to test two verticals I prepared at home: a quarter wave with 4 elevated radials for 80m and an end fed half wave for 40m (this time full size instead of the shortened version I used before). To be able to switch them easily - without taking down the mast - I use the same radiator for most of the length. The 80m antenna is a bit longer so I have an extension wire I can add / remove that connects to an SO259 socket with the four radials. When I use the antenna on 40m I disconnect the last bit with the radials and add my end fed transformer. Today was also a test to see if I could set up my 18m mast by myself in the field. Normally I use a support like my car or any sign post or fixed pole I can find. The contest location I use is just open field. After some trying I found a procedure that worked well. I used my VNA and my radio to see if the antennas worked and they indeed seemed OK. There was no enough time to do serious testing on the air and the bands were in terrible shape (s8-9 qrn/qrm). The plots and TX tests showed me that the 80m antenna is easily usable from 3.6 to well over 3.8mc. It dips in the phone contest region of the band. The bandwidth of the 40m end fed was much wider than the trapped version I used before. I can use it across the whole band. I also found that the radials of the 80m vertical really need to be off the ground some 10-15 centimeters. If they are too close to the ground the performance really deteriorates with SWR rising above 1:5 easily (1:1.4 when the radials are well off the ground). It seems I am ready for some action this weekend. Now let's hope the earth magnetic field calms down in time.